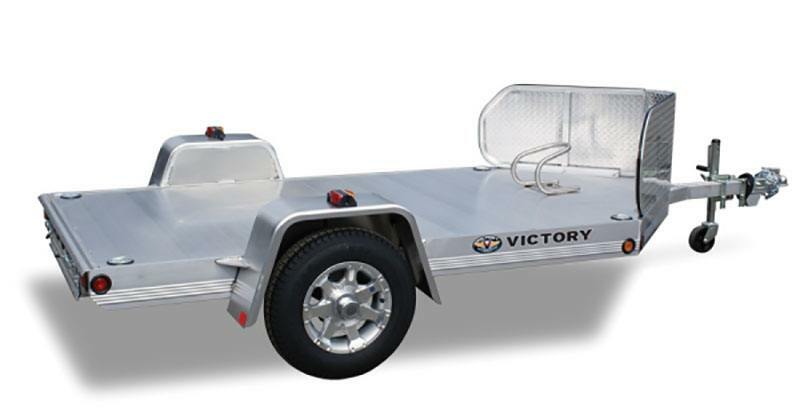 Ultra-premium all aluminum open one motorcycle trailer with torsion axle. The trailer comes with a toolbox mounted within the “V-nose” stone guard and a full trailer width stowage ramp for ease of loading/offloading. The trailer also has premium Condor wheel chock and heavy-duty floor mounted D-rings strategically placed to secure your motorcycle. The trailer comes with a wheel mounted on the tongue jack for easy one-person maneuvering in your garage or driveway. Extremely light-weight yet extremely heavy-duty, won’t rust or rot with aluminum rims and radial tires.